Of the three groups of venomous spiders native to the United States, only two -- widows and recluses -- can be found in Louisiana. Seven species of venomous snakes also reside there. Then there are eight large species of constricting snakes that call Louisiana home. Most spiders and snakes aren't aggressive toward humans, but they do attack when they're scared or on the defensive. Black widows are undoubtedly the most famed poisonous spiders, and of the three types, two -- southern and northern black widows -- reside in Louisiana. A lesser-known subspecies, the brown widow, also inhabits the state. Black widows have black bodies with a slight shine; southern black widows have a red hourglass or two red triangles on the underside of their abdomen, while northern black widows have two red bars instead. Brown widows come in more varied coloring, but are generally a light or medium brown to a dark grayish color. The hourglass pattern on the underside of their abdomen is usually more yellowish or orange. Although the U.S. is home to more than one dozen species of recluse spiders, only the most well known -- the brown recluse -- is native to Louisiana. Brown recluses are most easily distinguished from most other spiders because they have only six eyes, present in three pairs, whereas almost all non-recluse species have eight eyes in two rows of four. Brown recluses vary in color from tan to brown, and their abdomens and legs are uniformly colored and covered in fine hairs. Their bodies don't grow to more than 3/8 of an inch in length. Three types of poisonous rattlesnakes live in Louisiana: canebreak, eastern diamondback and pygmy rattlesnakes. Canebreaks average 25 to 70 inches in length and have beige bodies with dark brown crossbands and a reddish stripe down the back. Eastern diamondbacks grow 25 to 90 inches long and are tan to brown with dark brown diamond shapes with pale outlines. Pygmies are typically 10 to 20 inches long, tan or pale gray and have three rows of dark spots down their backs. Copperhead, cottonmouth, harlequin coral and Texas coral snakes round out the list of venomous snakes native to Louisiana. Though not generally considered as dangerous to humans as venomous snakes, a number of large constricting snakes also are found in Louisiana. These can pose a threat, especially to small children and pets. The two pine snakes -- black pine and Louisiana pine -- measure 25 to 85 inches and 25 to 65 inches, respectively. Prairie kingsnakes reach 16 to 50 inches long, while their speckled kingsnake cousins grow from 16 to 60 inches. 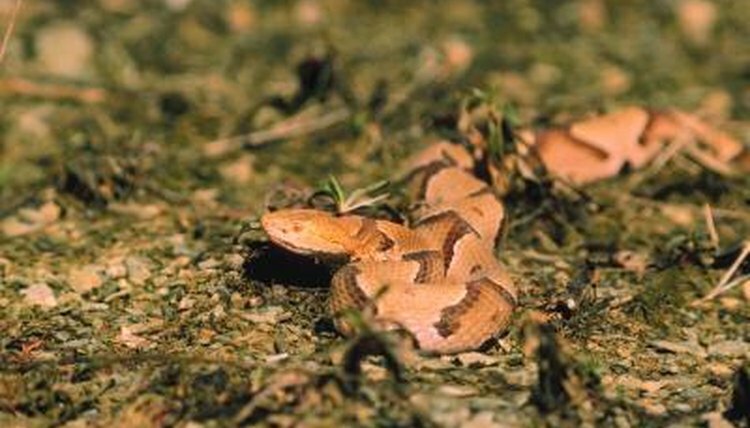 Louisiana is home to two corn snakes, red and Slowinski's corn snakes. The former average 25 to 65 inches and the latter are usually 24 to 52 inches long. Two rat snakes -- gray and Western rat snakes -- complete the list of dangerous constricting snakes in Louisiana. Both types grow 25 to 84 inches in length.